On the Muqata I spoke about the Tamar, Mudia and Shaked Bibi House slated for destruction near Elazar. I decided to drive over there on Tisha B'Av and see for myself what the fuss was about. Quite interesting, Elazar is a much larger village than I realized. Most of the time I go there it is to visit the zoo, or see some friends near the entrance. Anyway, I drove up the hill, and to the end of the town, before I realized I needed to turn left onto the dirt road, right before the end. I drove perhaps 100 meters on a dirt path which was contiguously and uninterruptedly connected to Elazar (not even a fence there, just a traffic circle). I following the edge of the mountain until I reached the end of the path. To my left the ground varied between planted fields enclosed with demarcation fences, and open uncultivated land, (and another house being built on the uncultivated, ownerless area). To my right was a steep slope leading to a sheer dropoff (cliff). The steep slope of the ground to my right was covered with weeds and extremely rocky terrain. Nothing that could be farmed without heavy equipment and a security fence (to keep you from falling off the mountain edge). Dug into the steep slope of this steep mountain edge was a another path to a parking spot. And around 5 meters below, at the edge of the cliff (on what would have otherwise been a physically inaccessible area) was a house! They flattened the land, and built a fence at the edge of their property to prevent people from falling off the edge. The view of the valley and the mountain across was stunning. In this first picture, what you see behind the house is the actual cliff and the mountains across the way. The context of this second picture isn't clear until you visit the site. The cliff edge is to the left. This area was flattened and the top of the house is at least 2 meters below the road to the right. You can't see it in the picture, but the mountain continues steeply up on the right. You can get a hint of it, from the undug area behind the house and the steps leading up to the right. I didn't actually get a chance to talk to the family. It was Tisha B'Av after all, and I didn't want to bother them. Here is some good news this Tisha B'Av. According to a YNet/Gesher poll, 64% of all Israelis want the Temple rebuilt, and that includes 50% of Secular Jews (excluding the secular, the range was 97%-100%, and 91% among Israelis who define themselves as "traditional"). 80% of Israelis (100% religious, 74% secular) believe that Tisha B'Av should still be commemorated today. Have a meaningful and easy fast. Tisha B'Av evening Wednesday, July 29 - join the Women in Green as they March around the Walls of the Old City of Jerusalem. But first the reading of Eichah will take place in front of the US Consulate on Agron Street at 8:00pm. I've been wondering if there is a correlation between Antisemitism and Jewish criminality. Not what you're thinking, that Antisemitism rises when Jews commit more crimes, but actually a reverse correlation. As Antisemitism rises, Jews tend to commit certain types of crimes, justifying it by saying they are looking out for number 1 in an world turned unfriendly. I doubt Bernie Madoff, or certain members of the Syrian community said, "Hey they want to kill us, let's rip everyone off and throw out the rules." But perhaps they did think to themselves that the world is not treating the Jews fairly, and we know what happens when that happens. And if they're not going to play fair and by the rules, we're not going to either. George Soros is certainly a perfect example of that philosophy taken to the extreme. Your thoughts? (And as always, no Antisemites will be allowed to comment). Leonard Cohen had his upcoming performance in an Arab village canceled. Now Arabs are harassing him to cancel his performance in Tel Aviv. Leonard, come home to Israel. Come perform in Judea,Samaria and Jerusalem. You will fill have standing room only crowds. Consider this an official invitation. 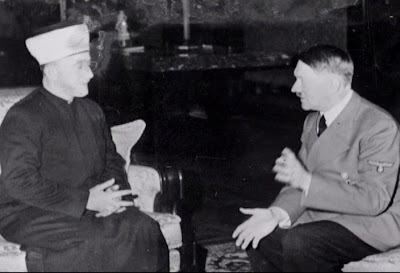 Foreign Minister Avigdor Lieberman has ordered Foreign Ministry officials to begin distributing a picture of Haj Amin al-Husseini, the late mufti of Jerusalem sitting together with Hitler. Lieberman says this is "because it's important for the world to know the facts". Those facts probably include the one that the Arabs have been trying to kill and exterminate the Jews long before there was a reestablished State or "Occupation". The other is that the disputed head of the PA (it depends on who you ask if he still heads the PA or not) Mahmoud Abbas is a well known Holocaust denier - in fact that was his thesis for his college degree. For some reason, the PA finds this all very upsetting. This is in line with Netanyahu's new policy of asking politicians he meets that demand that settlements be dismantles, why they want to make parts of the Land of Israel "Judenrein" - that seems to upset them too. Around a year ago, someone asked me, what about the other side of the Jordan River. If I believe in "Greater Israel" or "Biblical Israel" why aren't I demanding that too? Israel Land Fund chairman Aryeh King recently announced that he will begin taking action to reacquire Jewish land across the Jordan river that the Hashemite dictatorship is currently occupying. (80% of the population of Jordan identifies themselves as Palestinians, making them a defacto Palestinian state under Hashemite occupation). King reports that he has records of thousands of Jewish properties that the Jordanian government (founded 1946) seized in 1948 when the State of Israel was reestablished and the Jordanians declared war against the Jewish State. As it is against Jordanian/Hashemite/Palestinian law to sell Land to a Jew, intermediaries will be used from Europe to repurchase these formerly Jewish properties. In other news, Jordan has begun the process of stripping citizenship from thousands of its Palestinian citizens as tension between the Hashemite occupiers and the "indigenous" Palestinians rises. As I mentioned, Ynet is confirming that there conflict in Obama's Utopia. The report states that there are "professional difference" between Mitchell and Clinton, which would help explain why Clinton has no clue as to Mitchell's itinerary and why Clinton seems to have been cut out of other key developments. Meanwhile, Elliot Abrams says that Mitchell actually wants to resign - but Obama will only let him do that after he succeeds in getting some sort of settlement freeze. He continues on to make fun of Obama's policy and says that a settlement freeze at this point would backfire on Obama, who would then have to actually get the Arabs to give something in return. But if the freeze fails, He can still blame Israel, but then Mitchell retires in disgrace (or he can't retire at all). One of JoeSettler’s more prolific readers made the astounding statement that Jerusalem isn’t a “modern” city. The arguments she put forward were primarily that Jerusalem closes down for Shabbat and that Jerusalem can be divided. I’m hard pressed to understand those two reasons. To begin with, Israel is the Jewish State, and Jerusalem in particular is a Jewish City. Personally I see no irresolvable conflict between “modernity” and Judaism. I personally cannot accept the argument that since modernity can demand that the less economically well-off be required by their employers to work 7 days a week – and no consideration should be given to the culturally accepted day of rest - that that is a step forward - because its not. One of Judaism’s greatest gifts to humanity was the ending of what was effectively slavery of the working class, and the creation of a weekly communal day of contemplation and rest – something all society benefits from. My definition of modernity cannot include the forced labor of the weaker economic classes. Second, the attempts to divide Jerusalem are political. Physically, one could divide Manhattan to an East and West side or above 150th street and below it. And let’s take Berlin, another city divided. So that argument holds no water either. On the other hand, Jerusalem has free Wifi hotspots throughout its public areas, as well as in its cafes and coffeehouses (and other public venues). Jerusalem has 4 cellular firms servicing it, and I am hard-pressed to find any blackout areas (except in certain departments of Jerusalem's world class hospitals). I know from experience that’s not true in a modern city like New York. For that matter, Jerusalem has high speed cellular internet access pretty much anywhere in the city. The majority of (if not most) homes in Jerusalem have hi-speed internet access. Jerusalem has Intel and Teva and plenty of other leading global hi-tech firms with major offices and factories in Jerusalem – here because of Jerusalem’s highly-educated work force. I will admit that Jerusalem’s public transportation system used to be better, but once the light-rail is completed, things should improve. Jerusalem is multi-cultural. And while it is far from the richest city in Israel, poor does not mean not modern. And while we don’t have much of a theater district, we do have a museum row. The Israel, Rockefeller and Bible Lands Museum are archeological museums that are beyond compare when it comes to their archeological showcases and research of the Holy Land, regional and Jewish history. There are more bookstores per square mile in Jerusalem than perhaps anywhere else in the world. Unless reading books isn’t considered that modern. The Hebrew University is a world- class university, where much research that measurably improves the lives of people around the world (including in the US) is done. And Machon Lev – that is the embodiment of technology meeting Judaism meeting modernity. Jerusalem will soon even have electric filling stations for our upcoming electric cars. Jerusalem’s traffic is monitored in real time by live camera feeds all over the city. Jerusalem has an international airport (that was unfortunately shut down due to terrorism). And due to its unique geography and legacy infrastructures, Jerusalem has developed modern solutions to difficult problems – not faced by newer and less complex cities. So sorry, but your argument that Jerusalem isn’t a modern city because basically it’s also a Jewish city just doesn’t hold water. Get free coupons for Tnuva dairy products in America. The Israeli government will now start using the term "Normal Life" instead of "Natural Growth" when describing Jewish towns created over the 1949 armistice line. Which is of course exactly what we have here. Will Obama flip-flop and make Mitchell a liar? A few months ago Israel radio reported that Obama would announce a big Peace Initiative in July. That was confirmed by Obama special envoy Mitchell just a few weeks ago in an official briefing. The far-Leftwing paper Haaretz though says the announcement is imminent. But since then, Mitchell has canceled ("delayed") his meeting with Netanyahu, not once, not twice, but three times already. His next meeting is called for in a week or two. Meanwhile it appears that Hillary is no longer flying high in the Obama administration. The original excuse is her elbow, but she seems to be getting cut out of everything interesting lately. Could this mean no more inner circle for Mrs. Clinton? Anyway, will Obama make Mitchell into a liar? Is Obama going to flip-flop on his Peace Initiative announcement date? Rumor has it that not a single Arab country has moved even an inch towards Obama's most smallest requests of showing Israel any sign of reciprocity - leaving Obama in the lurch (of course, they could have moved an inch, and they're all just keeping it incredibly quiet). One can only hope that the anti-Semites will choose to follow through on their boycott of Israeli and Jewish products. The latest product we demand the anti-Semites boycott is an anti-radiation pill that provides the patient with a high survivability against radiation sickness- even from radiation levels like those of the Chernobyl disaster. The pill was developed in a joint effort between an American Jewish scientist and an Israeli researcher. The drug is estimated to be approved by the FDA within a year or two. Furthermore, besides adding a significant layer of protection against Arab/Islamic/Iranian terrorist's dirty and nuclear bombs and missiles, it might also allow for higher radiation exposures for cancer patients and help them with their treatment. Unfortunately, one can't count on anti-Semites to not be hypocritical, but one can dream. I don't know if the Hareidi boy is sick (like the Hareidim claim), or his mother is the sick (like the police and hospital claim). We'll perhaps have the answer to that in a few days. But what the heck is going on over there with all these Hareidi riots? Is it too hot outside and there's no air conditioning? Do they need a TV to help pass the evening? Is someone playing political games? Is it hate, ignorance or apathy that lets the enemies of Israel boldly lie while accepting those lies at face value and with moral equivalence. It's nothing new that the "Palestinians" have been trying to steal Jewish history and claim it for their own. And what they can't claim, they try to destroy. From their claims that there was no Temple on the Temple Mount where they temporarily parked their mosques, to the destruction of ancient Jewish religious sites and artifacts on the Temple Mount and throughout the country - the examples are unfortunately countless. Their latest claim is that Israel looted and stole the Dead Sea Scrolls. One doesn't know whether to laugh (or cry) and the utter patheticness of this latest claim, or be concerned that if the "Palestinians" can't claim the Isaiah Scroll and other biblical scrolls for themselves they may try to destroy them instead. If I were living in Toronto, I would demand extra guards at the Royal Ontario Museum. If you follow the Muqata twitter, you would have noticed a few days ago that I mentioned that England has decided to begin a partial arms embargo on the Jewish State. In retaliation for defending ourselves against Gaza terrorism, the UK has decided to place an embargo on replacement parts for some of the guns that our navy uses on the Saar 4.5 gunboats. Now I've discussed boycotts against Israel extensively in the past. The funny thing about embargoes and boycotts is that they can go both ways. Turkey, for instance, decided to insult our President and deride Israel for defending ourselves. Israelis in return decided to boycott Turkey, and as a result, tourism from Israel (which was very significant) has dropped to almost nothing, and the Turkish government is beside itself as a result. But there are other practical steps one can take on an individual level. For instance, not long ago, the British government was lobbying the Israeli government to reduce liquor taxes, to boost sales in Israel of Scotch whisky. With annual exports in excess of £2bn, Scotch Whisky is one of the UK's leading exports and supports thousands of jobs across the economy. Well there you go. You can shoot off this quick EMAIL to the "Scotch Whisky Association". I love your country's Scotch Whiskey, but due to the decision of your government to place a partial arms embargo against the State of Israel for rightfully defending themselves against acts of terrorism emanating from the Gaza strip, I must regretfully return the favor and boycott all Scotch whiskey produced in the United Kingdom (and encourage all my friends and associates who support Israel to boycott your products as well), until such time that your government chooses to rescind their decision. Now obviously, no one wants to boycott Scotch Whisky, but isn't this email the least our Kiddush clubs can do for our Jewish State? Up to $10,000 in scholarships, loans and grants for Jewish men (ages 20-30) to acquire a year of learning in Israel at Yeshivat Hamivtar. Now Israel is considering allowing the PA to train "special forces units" to go along with their regular army units. Hey Bibi, what happened to "demilitarized"? Do you understand the word differently than me? One of the proven-to-be-false assumptions of Oslo was that we can help defend ourselves by outsourcing fighting the terrorists who hate us to other terrorists who also hate us. That obviously didn't and could never work out - and in fact we've seen (and see) on more than one occasion that the bad terrorists are actually listed on the payrolls of the good terrorists. Yet here we are, doing it again. Has the Netanyahu-Mitchell meeting canceled? There was supposed to be a meeting 2 weeks after the Ehud Barak meeting, which happened because Netanyahu blew off/fobbed off Mitchell before the first planned meeting. Now the State Department won't give out a date for the next meeting. Could Bibi be doing the right thing, and be avoiding Mitchell, and showing him how unproductive a relationship it's going to be? Meanwhile, the State Department says that the US has not changed it opinion on the complete Settlement free, despite reports in certain Israel papers. Just a reminder that today is the 17th of Tammuz. In a recent interview, chief PA terrorist Mahmoud Abbas explains that his family was not chased out of Tzfat (where he was born) in 1948 by the Jewish army (or by any force at all). His family left on its own because they feared the Jews would take revenge on them for participating in the slaughter of 20 Jews in that city 19 years earlier. They were so sure the "Zionists" would now take revenge on them, now that they had the power to do so, that they ran away to escape justice. You can read more about it on A7. So once again Israel is transfering weapons to the Palestinian Terrorist Authority. This time it's 1000 Kalashnikov rifles (AK-47s). The delivery was delayed while Israel ran ballistic tests on every gun so they would know that when one of the PA terrorists kills a Jew they could properly identify the gun. To remind everyone, last week Makor-Rishon reported that Hamas had successfully infiltrated its men into the new PA army - though I won't be blaming Hamas for the next terror attack. Does the Road to Iran go through "Palestine'? Does the Road to Iran go through "Palestine"? Obama claims that to be the case. His administration believes that no Arab coalition against Iran can be built without there first being a resolution to the Palestinian issue. We settlers are the obstacle to peace and are enabling a nuclear Iran. The Israelis and other analysts disagree. Saudi Arabia and the other Arab states are much more threatened by a nuclear Iran then they are by a Palestinian State (which they don't really want either). Having a Palestinian State means they can't blame Israel for their own dictatorial failures anymore. And while the only thing more valuable to them than having that scapegoat is destroying the scapegoat, but since the destruction of Israel is not imminent on their part, they are more scared of what Iran will be able to do to them, then what Iran could do to Israel. In fact, just the other day Mossad chief Meir Dagan told Bibi Netanyahu, that Saudi Arabia will allow Israel to overfly its territory on the way to destroying Iran's nuclear facilities. Other Israeli officials have mentioned the quiet working relationship with the Saudi dictators. And from Saudi point of view, this could solve one if not two thorns in their side. Israel destroys Iran's nuclear capabilities, and if they're lucky, Iran destroys Israel in return. Could the Road to Iran go through Saudi Arabia, while "Palestine" remains a dead end alley filled with petty criminals and muggers? I think the answer remains yes. "The air in Eretz Yisrael causes wisdom"
This is perhaps best exemplified by the polls that indicate that 94% of Israelis would not define Obama as friendly to Israel, and 60% believe he will actually hurt Israel. Meanwhile, 74% (or 79% depending on the poll) of American Jews support or trust Obama. (I assume that 26% will be making Aliyah within the next few years, which will just make them even smarter). As a resident of the Land of Israel, sometimes it is the small things that remind me of how important I really must be. Today, North Korea launched 4 short range missiles into the Sea of Japan, and announced that through next week will be launching longer range missile, including in the direction of Hawaii. Yet despite the significance of that, the President of the United States thinks that my home, my family, and particularly my children are the greatest danger and obstacle to peace on the planet. So much so, that He uses my house and family as His excuse to not try and stop Iran's nuclear weapons program with their genocidal intentions. And you know what? He's right in a way. My home and my family are the biggest obstacles - not to peace - but to prevent the destruction of the State of Israel. That the President feels He needs to appoint Special Envoys to demand we stop having babies, and put extreme pressure on our Prime Minister to get him to take actions he's against, but the best action He can take against North Korea is to add some additional anti-missile defenses around Hawaii, and pointlessly trail a North Korean ship (possibly carrying nuclear weapons material) for weeks on end, well that just says it all, doesn't it? I'm not saying He has to do it, but could it be the President isn't even prepared to initiate offensive action to defend His own country from a missile attack? Iran is certainly watching how Obama reacts to North Korea's testing of the Obama administration. He'll probably run to the UN and angrily denounce this grave threat to international law (and the destruction of the Lost filming location). And all I can say is, we Jews plan to keep expanding. Natural Growth is going to continue. And we plan to continue to defend ourselves - all with the help of God. Without knowing what went on behind closed doors, publicly at least, Ehud Barak held his ground. What is still unfortunate is that this US plans to try to meet with Netanyahu in 2 weeks (and make this a regular event too). As if the Prime Minister doesn't have better things to waste his time on.